Deaf West Theatre and director Michael Arden have recreated the 2006 Tony Award winning musical Spring Awakening. The show is based on the 1891 play by Frank Wedekind about teenagers who are struggling with love and sexuality in a repressed Germany. The new production finds new elements and new ways to express the intense themes of the play; the show is placed in the historical context of 19th century Germany where deaf people were forbidden from using sign language — efforts that served to further silence them. 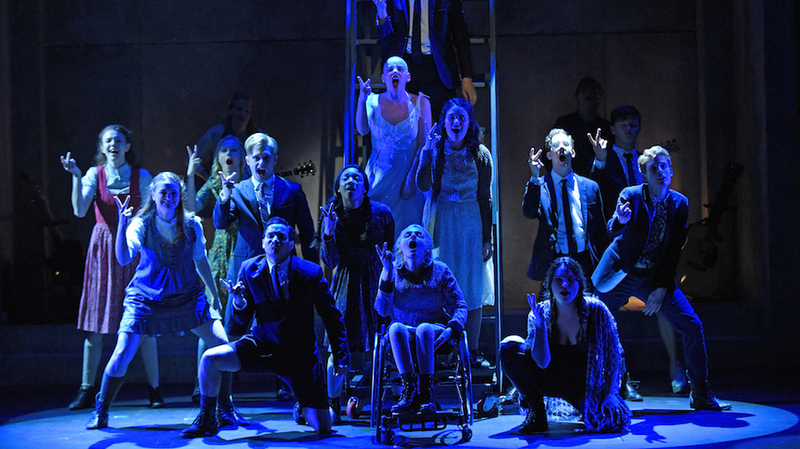 Deaf West’s Spring Awakening has a deeper level of teen angst than the original, and this becomes more powerful as it reflects their isolation from society. 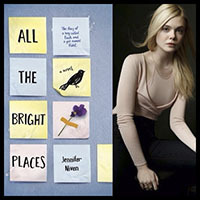 The original production used rock music as the voice of the teenagers, and now these characters are even more frustrated by their inability to verbalize their thoughts and feelings. 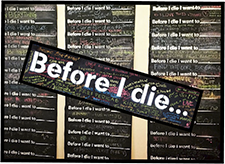 With this deeper level of teenage angst, there needs to be a louder voice for their plight. That voice is the marriage of the deaf actors signing their words while others speak for them in the background. The entire show is about miscommunication between adults and teenagers. There is a strong message about the importance of talking with your children, and it’s shown that silencing them will eventually damage everyone. In this production, there are several roles that are performed by two actors. One actor is deaf and signs all of the parts while a hearing actor is in the background singing and often playing guitar. The combination of actors adds another level of communication that is important in a story about miscommunication. The actors must work as one for the show to succeed. There is a red light onstage that is invisible to the audience, and it tells the deaf actors when to start signing so that their signing is coordinated with the songs. This show has ironically become about listening to each other onstage. They have to watch each other and follow their partners so that they flow together seamlessly. The actors have to trust their partners to speak for them. One speaks for the pair with voice while the other speaks through sign, and together they are stronger. Deaf West’s Spring Awakening is a beautiful production. The sign language acts as choreography and adds stunning images to the movement of the show. The staging between the characters who are double cast actors is so dynamic. At times, they appear to be images of each other while at other times the signing actor is central while the voiced actor is off to the side. There is an intense moment when Wendla (who is deaf) uses her own voice, which is so powerful because it is sudden and sharp. It highlights her vulnerability. Austin McKenzie plays Melchior and is making an amazing Broadway debut. Krysta Rodriguez (Smash, Addams Family, First Date) gives a chilling portrayal of the lost and damaged Ilse. Andy Mientus (Smash, The Flash) was phenomenal, especially in the Hanschen-Ernst scene. Camryn Manheim (The Practice) was great as Adult Woman. The only big name actor who did not leave an impression was Marlee Matlin (Children of a Lesser God, Switched at Birth) as Frau Gabor. The 2015–2016 Broadway season is in a ground-breaking movement to increase diversity on the stage and in the audience. Deaf West’s Spring Awakening along with Hamilton is making Broadway more accessible to audiences who are not the typical theatre-goers. It was incredible to see so many people signing in the lobby and during intermission. Onstage, there was one character who was portrayed by an actress in a wheelchair. As with sign language throughout the show, the wheelchair was integrated into the choreography effortlessly. Hopefully, this trend of using more diverse casting choices will continue with future Broadway shows. The Official Trailer for Star Wars: The Force Awakens Is Here! Regan Lavin is from Long Island, NY. She has several obsessions in her life, with the most important being theatre. She lives to be onstage and is lucky enough to take acting classes every Saturday in NYC. She spends her summers at the best theatre camp in the world in upstate NY. Last summer, she discovered a new passion...spinning fire. Hobbies are extra special when they require you to wet your hair, wear fire resistant clothing, and have a spotter on hand in case of emergency. In her downtime, she is flying through Supernatural and countless reruns of How I Met Your Mother. 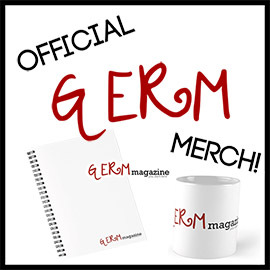 You can reach her at regan@germmagazine.com.